Set in a medieval fantasy world, the demons which reside in the underground kingdom of Cadash sought revenge on the humans who put them in the subterranean prison. The Balrog, a powerful demonic wizard born from a human woman has promised his followers they would rise up and take over the world. Centuries after they indeed have done that but the Balrog also kidnapped the princess, daughter of King of Dirzir. Many heroes have disappeared into the depths of Cadash in their attempt to rescue the princess before the Balrog could do the ritual where he would magically bind himself to the princess and become all-powerful and invincible. Could you save her before it is all too late? Best US Arcade version time as Ninja: Single-segment 0:26:10 by 'Pasky' on 2014-12-14. 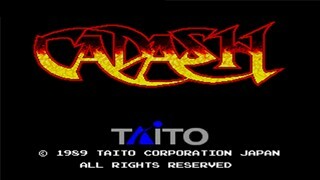 Cadash was originally released on the arcade platform in 1989 by Taito. It featured a head to head setup with the option to network two arcade cabinet with each other to allow 4-player cooperative game play. The Japanese and US versions of the arcade game featured a more difficult play through. Herbs cost 200 GP each, the maximum amount of herbs you could carry was 4. The world and European version of the arcade board featured herbs costing only 20 GP and you could carry a maximum of 8 herbs and the final boss HP is decreased (unknown if other bosses are affected). The game was ported to the NEC Turbo Grafx-16, Sega Genesis, and Sony Playstation 2. The Genesis and Turbo Grafx-16 ports were given dramatic changes to them which included the Genesis version not featuring the priest or the ninja and an altered level design, the Turbo Grafx-16 port featured a more balanced stat growth of each class and some minor level redesigns. The Sony Playstation 2 port was within the Taito Legends Collection that included a port of the arcade's world version of Cadash. The fighter is the melee character. He uses a sword and is somewhat strong early on but is outclassed by everyone else on later levels. He has a very short range, 2nd fastest speed, and his stat growth isn't that great and has the most equipment available for purchase in the shops. He's the worst character in the game because even fully equipped his stats and short range don't compare to the other characters. Overall a very mediocre character. The mage has the most powerful spells available. His spells are extremely powerful versus bosses but his shortcomings are his low hp, low defense, slow speed, and short range. He suffers a lot in later levels where there are several enemies on screen and they move quickly. The second best character in the game. The priest gets two healing spells, a spell that makes her invulnerable, a spell that can add time back to the game timer, and very long range weapon. Her only downfall is her damage output is low and she's slower than the ninja and the fighter. She does have one caveat with her damage and that is her weapon can hit enemies twice, once when it extends and once when it retracts. She's the easiest character to beat the game with and arguably the best character for casual play. The ninja is the best character in the game. He has the furthest range with his shurikens, the fastest walk speed, the best stat growth, the highest weapon damage, and highest defense rating later in the game. His only shortcoming is that he is very weak in the early game. This run was completed using the US version of the arcade board. The default dipswitch settings were used. Timer began when 'end' confirmed during the name entry screen and ends when the last hit was dealt to the final boss. I farm as little as possible in the first stage in order to be at level 2 by time I reach the black pudding boss. Experience is random, enemies have a base experience value and a random amount that is added on top or nothing at all so resets happen frequently here. I run back to the ledge on the second cycle to spawn an extra green jelly for the experience. Stage 1 went okay, a little slow crossing the moat but other than that, really well. Normally you would go through this stage, battle the octopus boss and get the mermaid charm so you don't take damage in water. This is skipped entirely as is visiting the inn and item shop. I grab the 3 star shurikens in the shop for the added damage and pick up a hidden herb. No mistakes made here. I grind a few levels and then kill the giant worm. I do this early to get the experience from the worm and be consistent with my experience level. Going to the worm at the end of the grind session changes nothing as he is still a two cycle fight. After returning from the worm I grind to level 11 for a few reasons, to get my maximum health and stats up (including walking speed which increases per level), increase damage done to enemies and ensure I'm level 14 by time I reach the final boss requiring less hits to kill him, and to gather gold to purchase life bells at the shop. I stock up on herbs which refill your life 10HP when it reaches zero and buy life bells which increases your maximum HP. I take the upper path to fight the Kelp boss to get my first elixir. Looking back I probably could have gotten through the area after the Kelp slightly faster by damage boosting earlier but overall it was still a really good area. I grab the armor at the weapon shop, stay at the inn to refill my life, and purchase herbs and the silver key to proceed to the next area. In stage 4 I try to grind and move as fast as possible killing zombies. I damage boost through most things and kill the green wyverns for experience. Grab the hidden herb and hidden gold and make my way to the town to stay at the inn, buy the next weapon and armor, and get the pendant to proceed. After backtracking to the grave I head towards the boss and I make a big mistake due to being distracted in real life >_>. I hit the wrong button and jumped when I meant to talk to the talk and after realizing it mash on the attack button to speak with it which allows you to proceed to the boss room. The mistake cost about a second or two but wasn't a deal killer. I kill the elemental boss, grab the horn and proceed to the next area. It's crucial that I survive to get the golden key and kill enough enemies so that I'm level 14 by time I reach the 2nd worm boss. The time spent on the open walkway attacking the stone dragons is done for experience. I made a mistake when damage boosting through the gray tree like monsters as I didn't realize I hadn't used the elixir yet, when you use a healing item you don't get knocked back. Not realizing this I paused in anticipation of being hit backwards but wasn't, this wasted about a second or two. After getting the golden key and final weapon I head back and lose some time on the open walkway trying to get experience from the rock dragons as they didn't want to cooperate. Not too much time lost there but it was a bit sloppy. I go through the other passage, grab the second elixir and herb and head for the worm boss. I got the very difficult two cycle because you have to jump and shoot him immediately upon entering and get 4 shots in before he rolls around and becomes invulnerable. PSHAW! I finally arrived at Baarogue (Engrish for Balrog). His human form is rather annoying as he can randomly fly around, ideally you want him to hover towards the right or left so you can constantly hit him with diagonal shots. I jump to take damage from touching him in order to keep attacking him and avoid the massive damage that the lightning incurs. Once in dragon form the fight went pretty well other than getting swiped by his tail that I should have avoided. The 2nd fight in the dragon form suffered a bit from randomness, ideally you want him to stay towards the right of the screen and not jump, he ended up jumping on me several times. I have to avoid the flame at all costs as it does massive damage and can kill me in 1-2 hits if I'm not careful. The fight could have gone faster but it was mostly out of my control. Overall I feel like this is a great time, it can probably be tweaked a bit such as purchasing less one or two less life bells and maybe buying one less herb. The last boss fight can be much faster if he decides to cooperate but in the end it is a solid run in my opinion.